Click here to view a map of Playhouse Square, which includes all available parking areas. From the west, take interstates 80/90 East (Ohio Turnpike) to interstate 90 East to Interstate 71 North to E. 22nd Street exit (veer left). Take E. 22nd to Euclid Avenue and turn left. Playhouse Square Center is located on the north side of Euclid just beyond E. 17th Street When leaving, take Euclid Avenue west to E. 14th Street and turn left; E. 14th Street leads to Interstate 90 West. 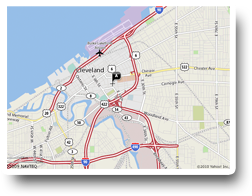 From the south, take Interstate 71 North to downtown Cleveland where it becomes Interstate 90 East; follow I-90 to the E. 22nd St. exit (veer left). Take E. 22nd to Euclid Avenue and then turn left. Playhouse Square Center is located on the north side of Euclid just beyond E. 17th Street When leaving, take Euclid Avenue west to E. 14th Street and turn left; E. 14th Street leads to Interstate 71 South. From the south, take Interstate 77 North to downtown Cleveland to the E. 14th Street exit and veer left. Take E. 14th to Euclid Avenue. Playhouse Square Center is located immediately to the right on the north side of Euclid just before E. 17th Street When leaving, take Euclid Avenue west to E. 14th Street and turn left; E. 14th Street leads to Interstate 77 South. From the east, take Interstate 480 West to Interstate 77 North to the E. 14th Street exit and veer left. Take E. 14th to Euclid Avenue. Playhouse Square Center is located immediately to the right on the north side of Euclid just before E. 17th Street. When leaving, take Euclid Avenue west to E. 14th Street and turn left; E. 14th Street leads to Interstate 77 South. From the east, take Interstate 80 West (Ohio Turnpike) to Interstate 480 West to Interstate 77 North to the E. 14th Street exit and veer left. Take E. 14th to Euclid Avenue. Playhouse Square Center is located immediately to the right on the north side of Euclid just before E. 17th Street. When leaving, take Euclid Avenue west to E. 14th Street and turn left; E. 14th Street leads to Interstate 77 South. From the east, take Interstate 90 West to State Route 2 West to E. 9th Street exit and turn left. Take E. 9th to St. Clair Avenue and turn left; take St. Clair Avenue to E. 17th Street and turn right; take E. 17th Street to Euclid Avenue and turn right. Playhouse Square Center is located just beyond E. 17th Street on Euclid Avenue. When leaving, take Euclid Avenue west to E. 13th Street and turn right, take E. 13th Street to St. Clair Ave. and turn left. Take St. Clair to E. 9th Street and turn right. E. 9th Street leads to State Route 2 East.